^ a b c d e f g h i j k l m n Wilden, JA; Cohen-Gadol, AA (15 August 2012). "Evaluation of first nonfebrile seizures". American Family Physician. 86 (4): 334–40. PMID 22963022. ^ "What Is A Seizure Emergency". epilepsy.com. Retrieved 8 May 2018. ^ Graves, RC; Oehler, K; Tingle, LE (15 January 2012). "Febrile seizures: risks, evaluation, and prognosis". American Family Physician. 85 (2): 149–53. PMID 22335215. ^ Bhalla, D.; Godet, B.; Druet-Cabanac, M.; Preux, PM. (June 2011). 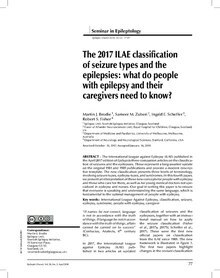 "Etiologies of epilepsy: a comprehensive review". Expert Rev Neurother. 11 (6): 861–76. doi:10.1586/ern.11.51. PMID 21651333. ^ Carlson, Neil (22 January 2012). Physiology of Behavior. Neurological Disorders. 11th edition. Pearson. p. 550. ISBN 978-0-205-23939-9. ^ Haut, Sheryl R.; Hall, Charles B.; Masur, Jonathan; Lipton, Richard B. (13 November 2007). "Seizure occurrence: precipitants and prediction". Neurology. 69 (20): 1905–1910. doi:10.1212/01.wnl.0000278112.48285.84. ISSN 1526-632X. PMID 17998482. ^ Oby, E; Janigro, D (November 2006). "The blood-brain barrier and epilepsy". Epilepsia. 47 (11): 1761–74. doi:10.1111/j.1528-1167.2006.00817.x. PMID 17116015. ^ Weston, Jennifer; Greenhalgh, Janette; Marson, Anthony G. (4 March 2015). "Antiepileptic drugs as prophylaxis for post-craniotomy seizures". The Cochrane Database of Systematic Reviews (3): CD007286. doi:10.1002/14651858.CD007286.pub3. ISSN 1469-493X. PMID 25738821. ^ Ratilal, BO; Pappamikail, L; Costa, J; Sampaio, C (6 June 2013). "Anticonvulsants for preventing seizures in patients with chronic subdural haematoma". The Cochrane Database of Systematic Reviews. 6 (6): CD004893. doi:10.1002/14651858.CD004893.pub3. PMID 23744552. ^ a b Price, Michelle; Günther, Albrecht; Kwan, Joseph S. K. (21 April 2016). "Antiepileptic drugs for the primary and secondary prevention of seizures after intracranial venous thrombosis". The Cochrane Database of Systematic Reviews. 4: CD005501. doi:10.1002/14651858.CD005501.pub4. ISSN 1469-493X. PMID 27098266. ^ Marigold, R; Günther, A; Tiwari, D; Kwan, J (5 June 2013). "Antiepileptic drugs for the primary and secondary prevention of seizures after subarachnoid haemorrhage". The Cochrane Database of Systematic Reviews. 6 (6): CD008710. doi:10.1002/14651858.CD008710.pub2. PMID 23740537. ^ a b c d Betjemann, John (23 November 2015). "Current Trends in Treatment of Status Epilepticus and Refractory Status Epilepticus". Seminars in Neurology. 35 (6): 621–628. doi:10.1055/s-0035-1564304. ISSN 0271-8235. PMID 26595862. ^ De Waele, Liesbeth; Boon, Paul; Ceulemans, Berten; Dan, Bernard; Jansen, Anna; Legros, Benjamin; Leroy, Patricia; Delmelle, Francoise; Ossemann, Michel (10 September 2013). "First line management of prolonged convulsive seizures in children and adults: good practice points". Acta Neurologica Belgica. 113 (4): 375–380. doi:10.1007/s13760-013-0247-x. hdl:1854/LU-4182539. ISSN 0300-9009. PMID 24019121. ^ a b Doherty, MJ; Haltiner, AM (23 January 2007). "Wag the dog: skepticism on seizure alert canines". Neurology. 68 (4): 309. CiteSeerX 10.1.1.1003.1543. doi:10.1212/01.wnl.0000252369.82956.a3. PMID 17242343. ^ Bonnett, LJ; Tudur-Smith, C; Williamson, PR; Marson, AG (7 December 2010). "Risk of recurrence after a first seizure and implications for driving: further analysis of the Multicentre study of early Epilepsy and Single Seizures". BMJ (Clinical Research Ed.). 341: c6477. doi:10.1136/bmj.c6477. PMC 2998675. PMID 21147743. ^ a b Mormann, F.; Andrzejak, R. G.; Elger, C. E.; Lehnertz, K. (1 February 2007). 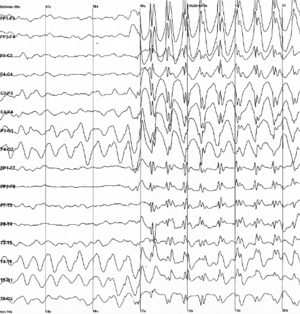 "Seizure prediction: the long and winding road". Brain. 130 (2): 314–333. doi:10.1093/brain/awl241. ISSN 0006-8950. PMID 17008335.